Use the left and right arrows to scroll through decor. A few weeks ago I was shopping with my mom at Hobby Lobby and commented when going into the store "Oh, I don't need a cart." That must be one of those comments that causes the universe to say "Did you say cart? You must need a cart and a lot of stuff to fill it up with. Here you go!" We went into the store with me convinced I'd be coming out with nothing. And then I saw it.....a beautiful large dough bowl made of wood. Have you seen them in the store? So many sizes and shapes and actually made of wood rather than the wood-looking resin that so many are made out of now. Obviously as you can see from these pictures, one of the bowls came home with me. It was 50% off, so who could pass that up?!?! 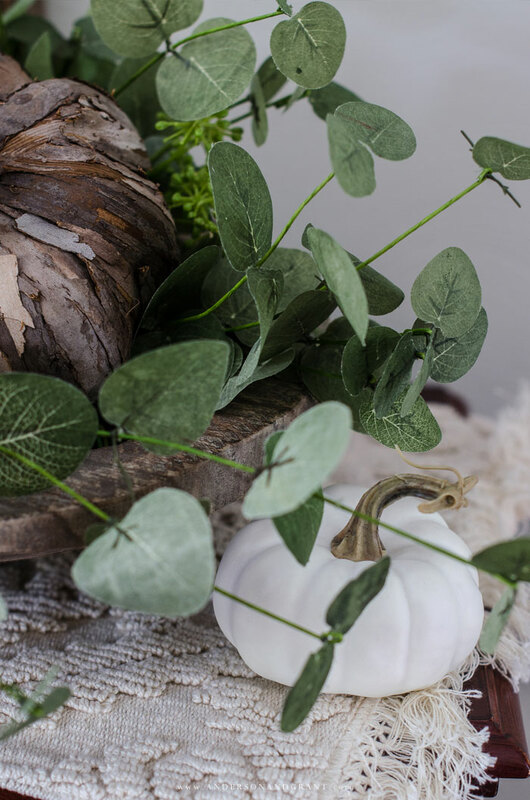 The rest of the story is that once bowl went into my cart, I found a pretty seeded eucalyptus garland that nestled right inside the bowl.....also 50% off. Meant to be, right? 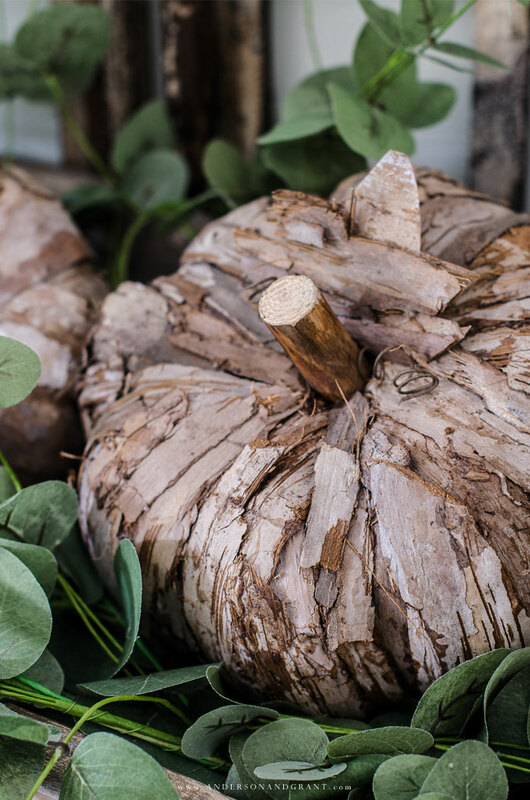 Well, then three rustic birch bark pumpkins that fit perfectly into the eucalyptus filled bowl called to me so into the cart they went, as well. The longer I shopped in the store the more I realized that plans I had for today's post needed to be scraped because this was the vignette that needed to be created. Don't you love when you place things together and it all just looks right? So many times, I spend hours moving decor, tweaking placement, exchanging one thing for another, and in the end, it still just doesn't look like I want it to. But then there are times, in the middle of the Hobby Lobby store, that it all just falls into place. 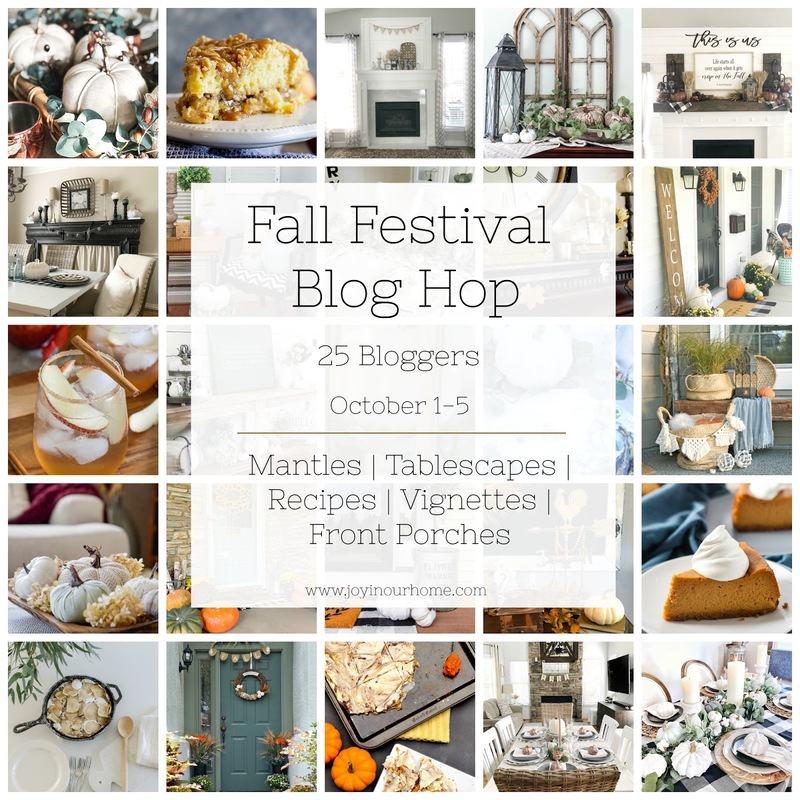 Once I got my purchases home, I began creating my vignette by first draping a textured table runner across the mantel top. 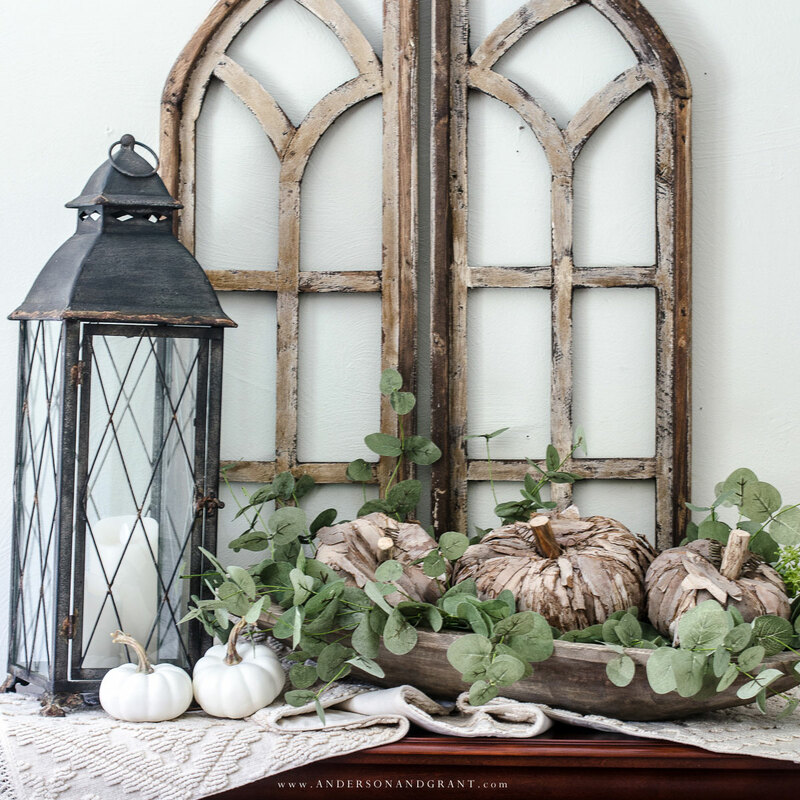 It's a little unconventional to use a table runner on such a small space, but I actually love how it looks laying in such a freeform way and it brings some lightness to the dark bowl and pumpkins. 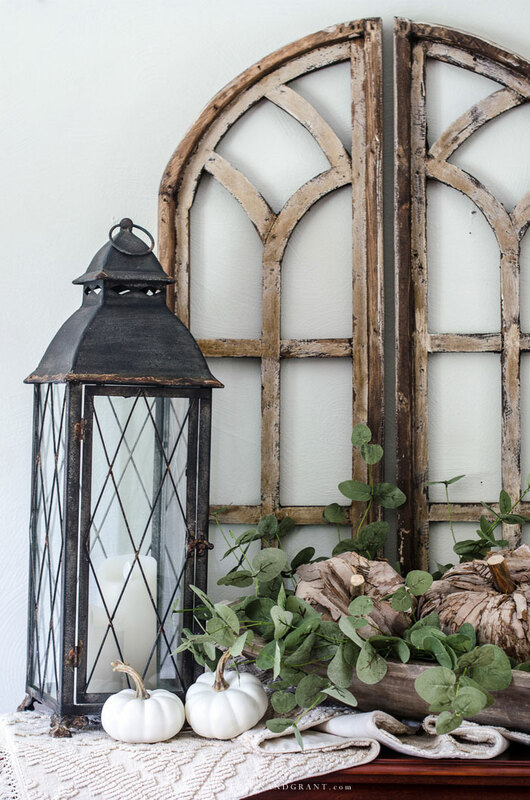 Beside the bowl of pumpkins is a tall metal lantern adding contrast to all the wood. And then I tucked in a few small white pumpkins around everything for the finishing touch. 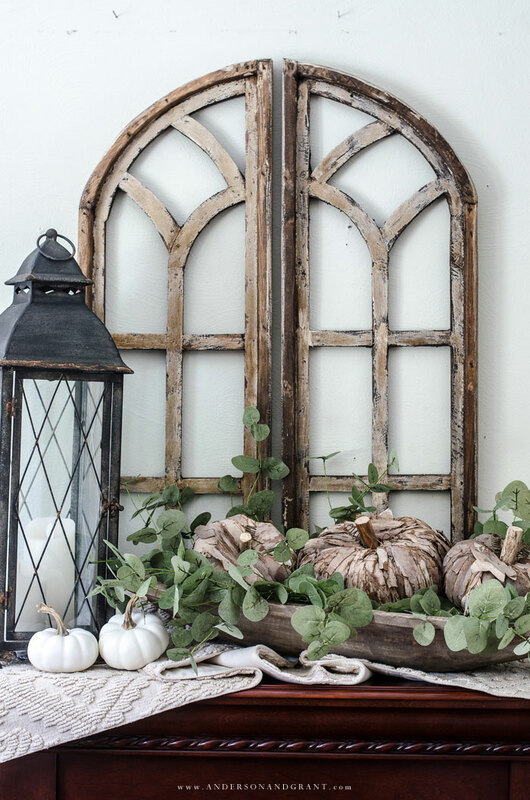 Hanging behind the vignette is a pair of arched rustic window frames that I think bring the whole vignette together. The color and wood texture pairs nicely with what is going on in the mantel display and they add height behind it all. 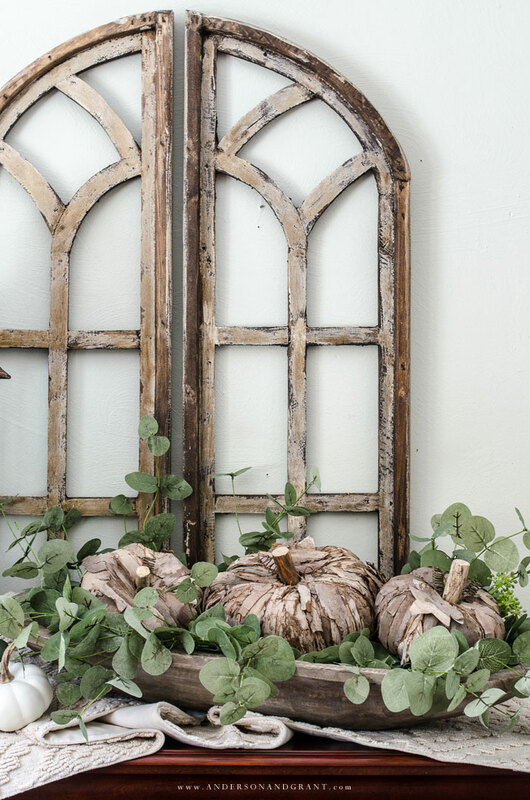 Having a backdrop like these frames can keep the vignette you've put together from being lost against a light, neutral wall. 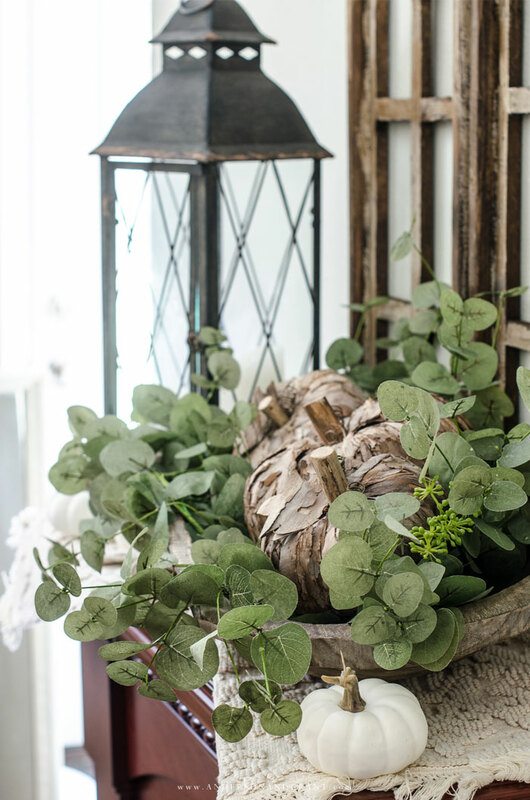 While this vignette may be missing all those vibrant colors of fall, I really love how it turned out. 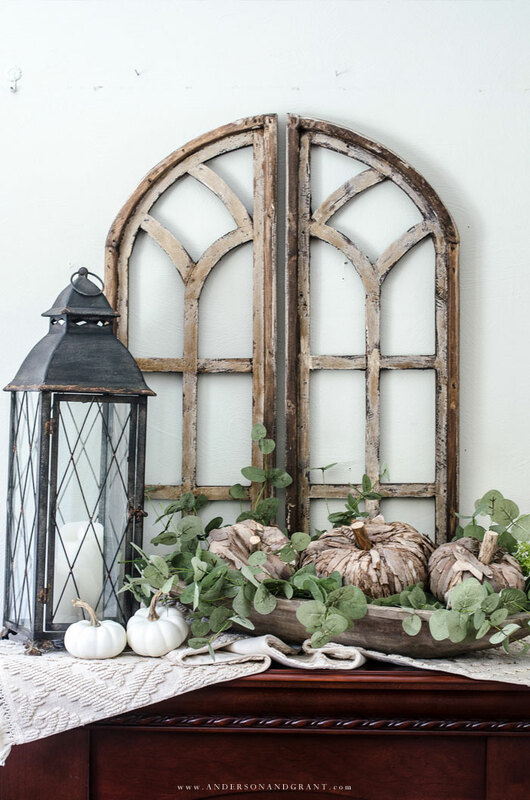 We have so many beautiful sources of inspiration when it comes to decorating our home, but there is nothing wrong with taking a step back and doing it simply. 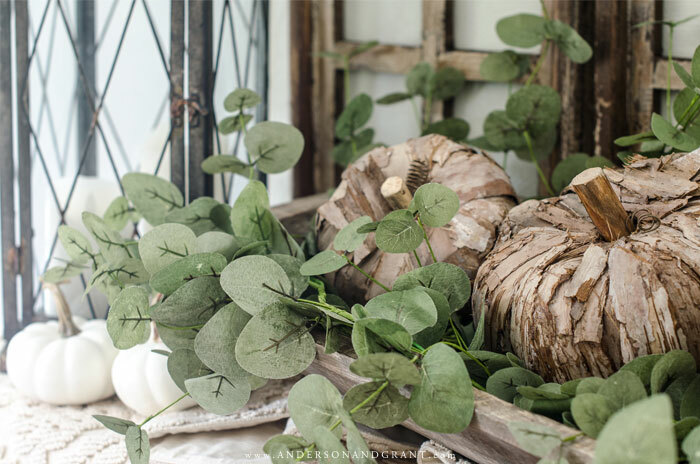 You don't have to have pumpkins on every surface and a room that screams "I decorated for fall!" to be able to enjoy the season just because everyone else does. I've decorated many mantels in the past, but I've got to say that this is probably my favorite because it feels most like me in this moment and wasn't created by trying to copy anyone else. You'll find the most success and contentment with decorating when you listen to your own heart and do what works for you. Thank you so much for visiting my online "home" today and taking a look at my mantel. 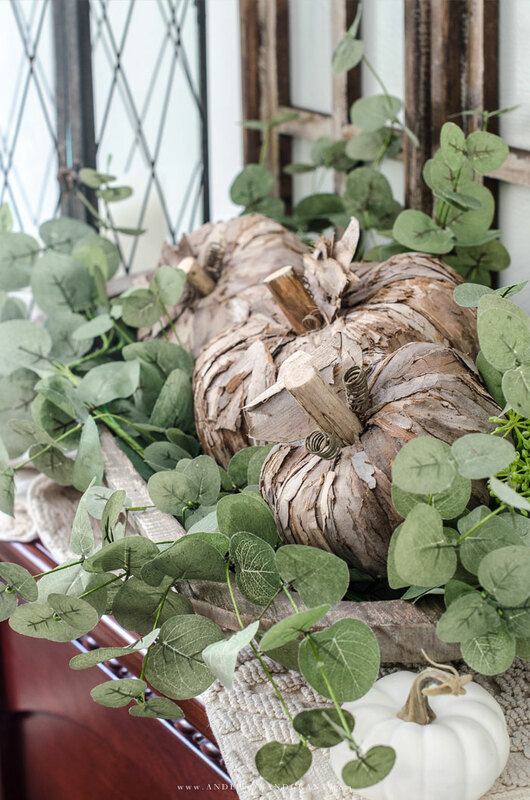 Cindy from DIY Beautify is the next stop on our tour today and she is sharing three helpful tips for creating a stunning fall vignette that I know you'll want to read! INTERESTED IN DECOR ON MY MANTEL? 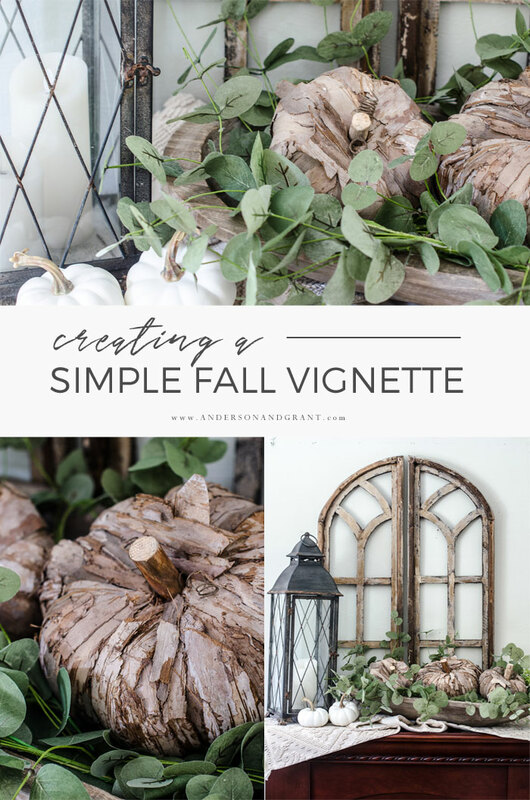 I'd love for you to continue on this tour and check out some of these other posts filled with fall inspiration!